analysed how waste and health can be addressed as part of European countries' efforts on environment and health, and towards the Sixth Ministerial Conference on Environment and Health in 2017. Waste has serious impacts on human health and the environment when not dealt with properly. Sustainability is also central: while a circular economy is an increasingly desired goal, the health implications require close attention. A circular economy is the organization of human activities in a way where unwanted output from a certain production becomes input for another, with limited or no waste. Very large differences exist between and within European countries on waste management. European Union (EU) countries benefit from extensive legislation, although with variable degrees of compliance. Some WHO Member States face stark problems due to old technologies and informal disposal activities, including open-air dumping and burning of all kinds of waste. Besides impairing exposed people's daily lives, this results in acute and long-term health consequences such as cancer, and cardiovascular, respiratory and neurological disease. 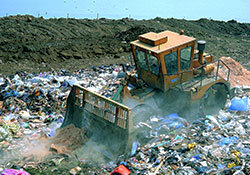 Waste landfilling, at the bottom of the EU waste hierarchy, is of particular concern. Besides its environmental impacts, detrimental use of land and poor sustainability, landfilling has been shown in some cases to result in measurable health impacts. Yet, thanks to modern waste treatment technology and efficient systems, landfilling has been discontinued in some countries such as Germany in 2005. Experts at the consultation discussed certain questions. How much have these countries gained in terms of prevented health impacts from landfilling and old generation waste disposal? Could all European Member States phase out landfilling, for the sake of their people's health and wellbeing, now and in the future? What arguments can the health sector offer to further promote throughout the WHO European Region the EU waste hierarchy, which has reduction of production, re-use and recycle as top options?